The above info came from Elwin Blaine Coldiron, and was edited by yours truly (contact me). The image came from teamARTAIL. Evangelion Unit 01, like Unit 00, was constructed in secret at NERV's Geo-Front headquarters. It was originally constructed as a test unit, following up on concepts and improvements from the previous unit. 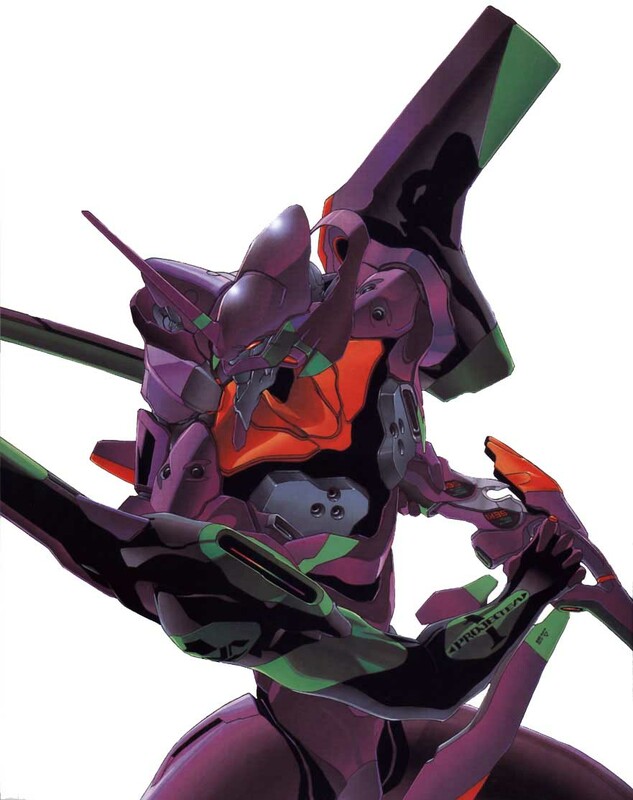 Unit 01 carries a unique green, purple, and orange color scheme. However, it was four days after Rei Ayanami was injured in a Unit 00 activation test when Sachiel, the 3rd Angel, attacked Tokyo-3, ending a 15-year period since the Second Impact. Fortunately, it was on that very day that Shinji Ikari had arrived, who was in turn brought to the Geo-Front by Misato Katsuragi, who had arrived one day before. At first, Shinji refused to board the Unit (he was confused and a bit intimidated by his father, Gendo, after a three-year estrangement). Gendo Ikari, hoping to convince his son otherwise, sent for the injured Rei to pilot Unit 01. After seeing Rei and her plight, Shinji was more inclined to agree. It was at this point, and unknown to the others during the battle, that Unit 01 displayed anomalous behavior: it moved on its own accord. The unit's right hand ripped free from its restraints to shield Shinji from falling debris when building blocks above the Geo-Front fell on Headquarters. The Unit appeared to be protecting him specifically. This and Rei's condition finally convinced Shinji to get in. During the battle with Sachiel, all connections between Shinji and Unit 01 were broken, but somehow, the Evangelion showed its unusual behavior again, going into a "berserker" mode and savagely attacking the Angel before Sachiel wrapped itself around Unit 01 and self-destructed. The damage to Unit 01 was moderate but not significant. It was soon repaired. Despite all this, Shinji and Unit 01 became the most battle-tested pair in NERV's battle against the Angels. This pairing was broken only briefly when Shinji left NERV in protest of his father using the "Dummy Plug" system in order to destroy the 13th Angel, who had possessed Unit 03, for which the Evangelion was destroyed and Shinji's friend Toji Suzahara was seriously injured. Briefly, Rei Ayanami was the pilot of Unit 01. But when the 14th Angel attacked NERV directly, the Evangelion rejected Rei. And when Gendo Ikari tried to activate the "Dummy Plug" system, the Evangelion also rejected it. It was then Shinji had returned, and he battled the Angel. It was during this battle that the ultimate secret of the Evangelions was revealed: that they were living beings, and their pilots their living souls. During the battle with the 14th Angel, Unit 01 had activated itself even with all its power sources depleted, destroyed the Angel, and proceeded to eat the Angel's core — and incorporated its Super Solenoid (S-2) engine in itself. Shinji was converted to LCL fluid as a result of the activation — a similar fate that had happened to his mother, Yui. However, unlike what had happened ten years earlier, Shinji was saved. Unit 01 would later play an important part in defeating the last Angel (see Kaoru Nagisa), as well as when a JSSDF force had attacked NERV, as well as being a pawn in SEELE's plans in completing the Human Instrumentality Project, for which all human souls were to be combined as one. The above description came from Elwin Blaine Coldiron and Who Wants to Know?, and was edited by yours truly (contact me).